Why am I feeling so on edge? 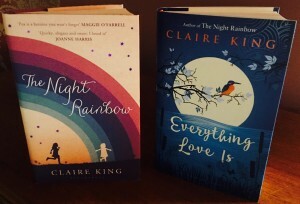 When my debut novel The Night Rainbow was published back in 2013 I was a little nervous of course, but I was mostly just massively over-excited: I was absolutely happy with my book, having it published was a dream come true and I was REALLY looking forward to other people being able to read it. With the publication of Everything Love Is imminent (July 28th), although in some ways I feel much calmer about publication itself because I know much more about what to expect and what not to expect, my anxiety about how it will be received by readers is much greater. I’ve been trying to work out why that is. Although The Night Rainbow will always hold a special place in my heart, I like this book just as much for different reasons. So, what is it exactly? I’ve come to the conclusion it’s not the reviewers, or the new readers that concern me. If this were my debut I’d be perfectly fine. In fact, I’m worried what readers who loved The Night Rainbow will think. How will this book compare? When you publish a debut novel your writing is generally critiqued on it’s own merits, and compared (even in readers minds) to other authors, but it cannot be compared to other novels you have written. Most importantly it cannot disappoint a reader who bought this book because they loved your first. But a second novel can. It’s not really a question of the standard of writing: writers tend to become more accomplished as they go through their careers, unless a book has been hurried along due to an excessively short publication deadline or something has gone awry with the editing process. But until you have published a second novel, your first is a lone star, a single point of reference. Unless the second is a sequel or part of a series, it will tell a completely different story to the first. The voice will be different, as will the themes and the characters. There will be similarities that mark out the book as a product of the same author, but it will be largely unfamiliar. A second novel encourages direct comparison. 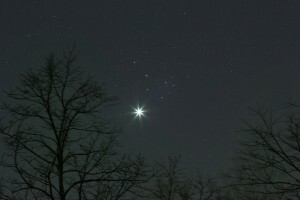 A second star alongside the first, their positions are marked in relation to each other. It is only when there is a third star that they start to make up a picture of something more – who the author is, their style, what you can begin to expect of them. When you start to see what ties an authors books together – then they become a constellation. As I finished writing Everything Love Is – and even more so as I embarked of the first draft of my third novel – it has become clearer to me what shape my own constellation is taking. I understand more about what is important to me as as a writer, what seems to tie together the stories I want to tell and how I want to tell them. This is something of a self-discovery, and feels really exciting. But of course that is getting way ahead of myself and is still overshadowed right now by my pre-launch preoccupation with how Everything Love Is will be received by those readers who are waiting for it in anticipation after having loved The Night Rainbow. Because it’s basically all about the readers. Meanwhile there are a lot of other authors’ second novels out – and coming out soon – this year that I’m very keen to read. After their cracking debuts I really want to see what their next books will bring. It’s wonderful to discover an author whose work you want to keep going back to. I’m looking forward to seeing which of these will become some of my favourite constellations in my literary universe. Are there any growing in yours? As you know, Claire, I absolutely loved The Night Rainbow, and I wrote a review straight from the heart. A lot of people found my review helpful. But the more I think about it, the more I take into account the fact that nobody reads any book in the same way; everybody brings their own attitudes, their own experience, their own baggage, and reacts to the book differently from anybody else, and, more often than not, not in the same way as the author. That’s why when one reads two reviews of a book one sometimes wonders if the reviewers have been reading the same book. It’s a rare book that appeals to everybody – perhaps even rarer than that – but if it doesn’t strike chords with me this time it will strike chords with somebody else, because you’re a first-class writer. Okay, you can have off days as a writer, but that only accounts for a handful of pages, and those dodgy pages are corrected at the editing or the re-writing stage – you don’t suddenly lose your writing skills. But whereas the jobbing writer keeps writing the same book over and over again, the skilled writer says different things in each book, which is admirable, but it may mean that a later book appeals to a different audience. But it’s absolutely natural to feel nervous about one’s books. I always give mine to Joan to read as soon as I’ve feel it’s (more or less) ready. Then I go through hell, because the book that I felt so confident about a few hours before has become in my mind 80,000 words of rubbish, not worth the paper it’s printed on. And then comes Joan’s reaction – not always uncritical, but always encouraging; and I start to feel better because I’m experienced enough to know that I don’t write rubbish. But that still doesn’t stop me worrying if people are going to buy my book – that’s the stage I’m going through now with the book launched yesterday. And the more I think about you, the more confident I am that Everything Love Is will be a great book, because you don’t write rubbish either. And I will be astonished if I don’t like it, because part of the attitude I’m bringing to it is a belief that you are a great, sensitive writer – and I know I’m not alone in thinking that! I like how you have explored this theme with the image of the two stars. I think nerves are inevitable for most of us each time we do something new – okay you’ve published a novel before but you’ve never published a second novel. But of course you do have a lot of goodwill that’s been engendered with The Night Rainbow so that, even if it doesn’t read as expected, readers will trust your ability to lead them through the story. But in this I especially liked the part about becoming clearer about the shape of your own constellation – that is indeed exciting. And, as you’ve said to others, have fun!